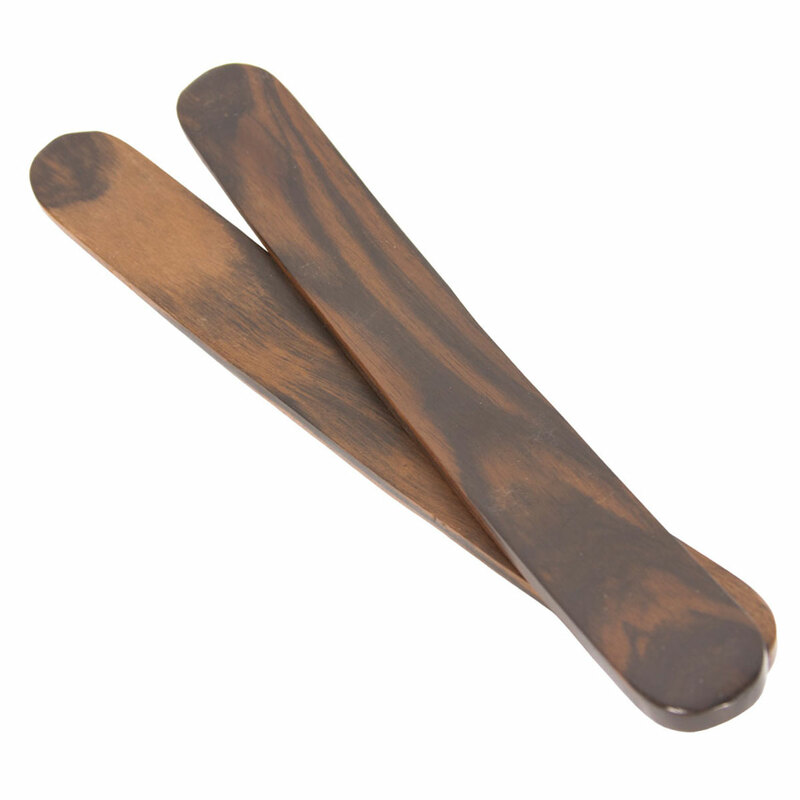 DOBANI 7 Inch Bones Blackwood Curved Smooth Pair. Smooth set of Blackwood bones: 7" long x 7/8" wide, with a slight curve. The thickness tapers over the length from 1/16" to 1/4". The dense hard Blackwood gives a clear tone when struck. Hold one between the index and middle fingers, so the flat side is between the fingers and the concave curve is toward you. This one should hang down along your inner wrist. The second one is held between the middle and ring fingers with the flat side between the fingers and the convex curve facing the convex curve of the first bone. Let it hang down along your inner palm and swing freely. Now curl your middle finger so that it lays on the edge of the first bone the one between your index and middle fingers. The first bone should be held so it will not move. Curl your ring finger so it lays on the edge of the second bone. This should be held, but allowed to move. The second bone will move and slap into the first. Now hold your hand so your thumb is pointing at your chest. Then, twist your wrist away from you, once; as if cranking. This is the basic slap. The bones will clap against each other in a variety of rhythms. Lots of fun.